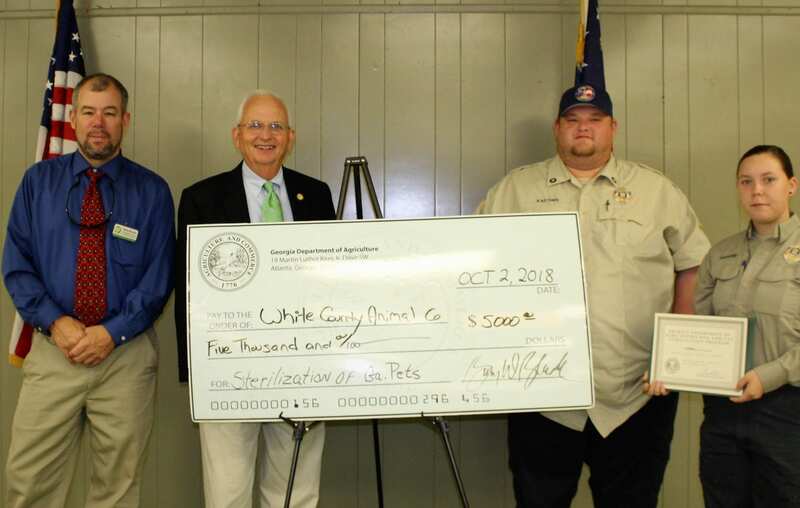 ATLANTA, Ga. – The White County Animal Shelter has been awarded a $5,000 grant to assist with spaying and neutering Georgia’s companion animals by the Georgia Department of Agriculture. Georgia’s Agriculture Commissioner Gary W. Black announce the issuance of $425,000 in statewide grants this week. Out of 133 applicants, 71 state licensed animal shelters and animal rescue organizations were awarded the grants, 29 of those are in the Atlanta area. This is the fourth set of grants to be issued through the Dog and Cat Sterilization Program which is funded by the purchase of the Dog and Cat Sterilization Auto Tag, income tax checkoff, and from direct contributions to the program. Since inception, the Dog and Cat Sterilization Program has been utilized to sexually alter over 100,000 companion animals. The future of the program is now much more optimistic thanks to the restoration of full funding during the 2018 Legislative Session. As it stands now, $19 from the $25 purchase of a new plate and $20 of the $25 renewal is appropriated toward the program. Grants range from $2,500 to $140,000 each and were awarded based on the highest priority after considering factors such as targeting of important animal populations, ability to increase surgery numbers, cost-benefit ratio, record of grant applicant and sustainability.